Allow me to introduce my backyard "mascot", Fat Phil. I moved to Spring Hill about 5 years ago and never had a close, personal relationship with a groundhog (who has?). Unfortunately, you mainly see them dead on the side of the road. We moved here in the fall, about the time these critters hibernate. 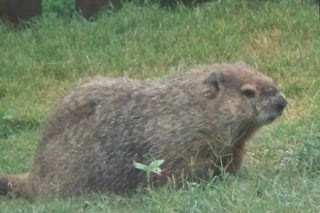 Imagine my surprise when I'm sitting outside the following May and out walks the fattest groundhog I've ever seen. He sized me up, decided I was OK and went about eating his clover. Well, I set about learning all I could about these guys, aka, woodchucks. Contrary to popular belief, he's not destructive (at least not in my yard) and seems concerned with eating, eating and eating. Currently, he devours all the leftover safflower seed under my feeder and he's crazy about vanilla wafers. I've found his burrow entrance and he sticks pretty close, but never going straight to it in case of danger...he doesn't want to give away his hiding place....smart dude. He brings smile to my face just about everyday! That was a lovely web log!